Companies can use GetFeedback's customer success software to send online surveys to their customers, giving them the opportunity to provide feedback. As a customer feedback tool, it's only fitting for GetFeedback to practice what they preach. Users who are reading up on customer feedback strategies can also see the tool in action at the same time. 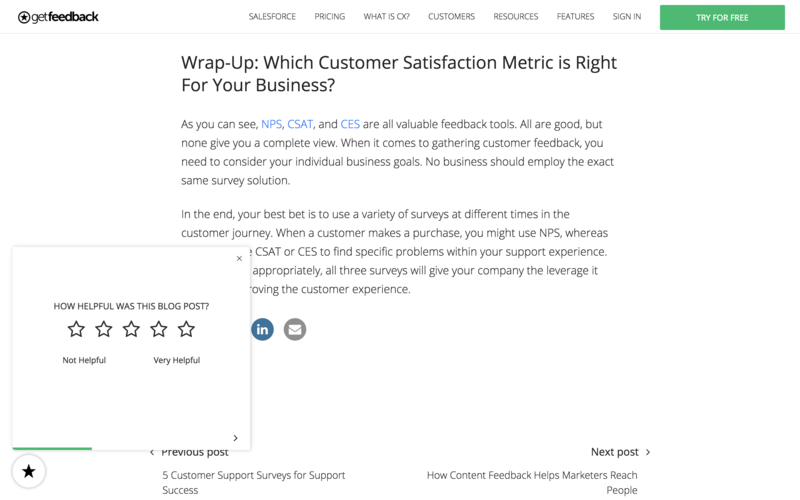 In this example, they use a 5-point NPS survey to get a sense of whether or not their blog post was helpful. Readers have to scroll to the bottom of the blog post to even see the survey. It wouldn't make sense for this survey to pop up when someone is at the top of an article because they wouldn't know at this point if the article is helpful or not. 5-point NPS surveys can be useful when wanting to determine the usefulness of something. A traditional NPS survey wouldn't be necessary here because the question is too narrow.